Ability to use the price plan grid instead of the price plan table. In addition, the grid colors and text are customizable! Input Text box variable displays how many characters have been typed of the allowed characters. Additional text cannot be added after the maximum allowed character count has been reached. Image Upload feature allows the user to build an image library. Image can be set to require cropping. New cropping features allow the user to crop, rotate or clone the image. 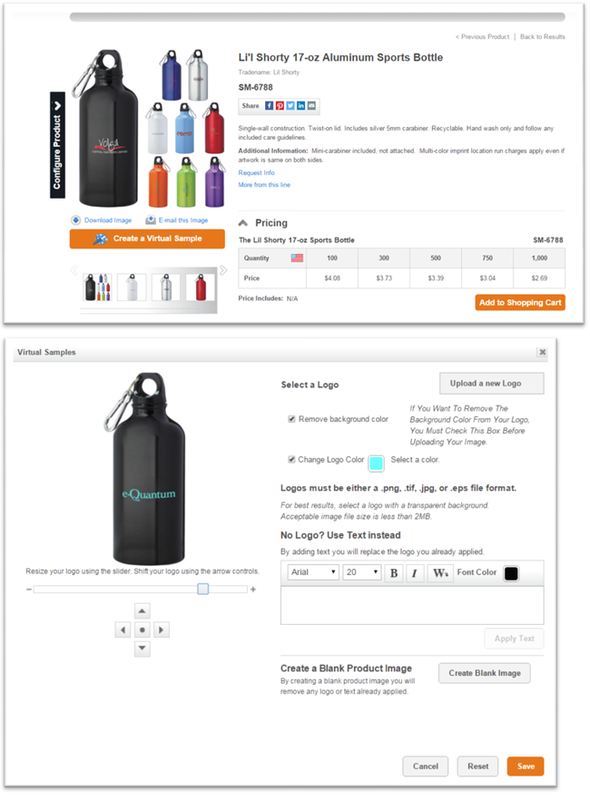 Managers can once again edit the Q-Design item in Pending Orders. Please note, in order to utilize the NEW Q-Design User Interface you MUST update to the NEW Q-Net featuring PCI Compliance and NEW Managers Approval as well as update all of your Q-Net sites to Collapsible. Webinars have been scheduled for Tuesday, May 10th at 11am PDT and Thursday, May 12th at 11am PDT. Please email cori@e-quantum.com to register and be sure to indicate which day you prefer. Contact sales@e-quantum.com with any questions. 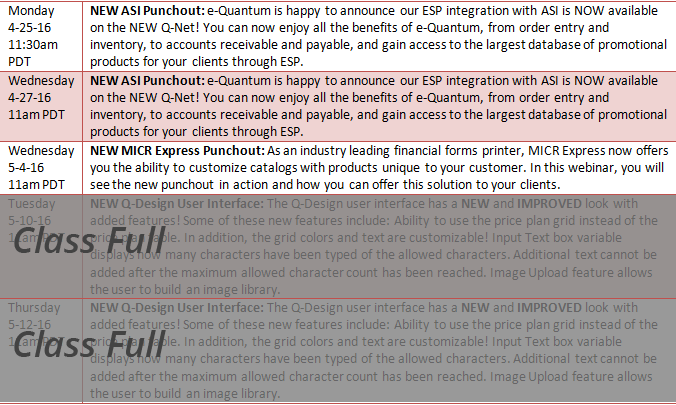 e-Quantum is happy to announce our ESP integration with ASI is NOW available on the NEW Q-Net! 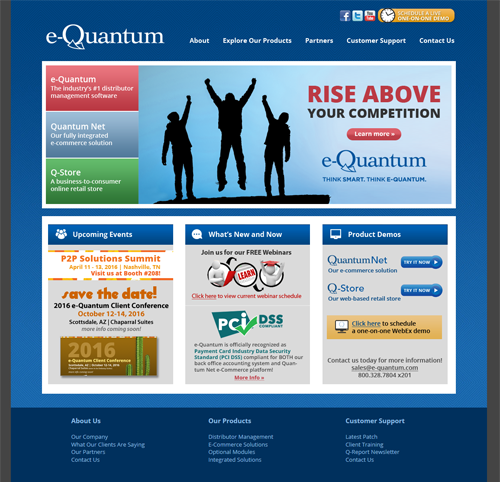 You can now enjoy all the benefits of e-Quantum, from order entry and inventory, to accounts receivable and payable, and gain access to the largest database of promotional products for your clients through ESP. Integrated ESP® Sourcing System - Access the largest, most accurate, searchable collection of promotional products in the industry. Advanced Search Engine - ESP Websites contain the most powerful and intelligent Advanced Search Engine, streamlining your customers' shopping experience. Your ESP Website provides access to up to 400,000 products from over 3200 ASI supplier members. Your ASI Company Store enables you to upload up to 1,000 products in 10 product collections - include your own custom products or import merchandise directly from ESP. Professionally designed and ready to go - Select from 100s of design choices and easily customize details with the built-in design studio -your ESP Website is up and running in minutes! View confirmed product info and pricing. Best-in-class Virtual Sample technology - Your clients are able to preview imprinted product orders by uploading their logo onto all Virtual Sample-enabled product images with one click. Sales-driving features - Shopping inspiration is easy with built-in features like Product of the Day, Product Videos and Product Collections. Social Media - ESP Websites can instantly sync to your Facebook, Twitter and LinkedIn profiles to help drive traffic to your site. Integrates with e-Quantum and Quantum Net. Please note, in order to activate the NEW ESP Punchout you MUST update to the NEW Q-Net featuring PCI Compliance and NEW Managers Approval as well as update all of your Q-Net sites to Collapsible. Webinars have been scheduled for Monday, April 25th at 11:30am PDT and Wednesday, April 27th at 11am PDT. Please email cori@e-quantum.com to register and be sure to indicate which day you prefer. You do need to subscribe to ESP if you have not already done so. Contact ASI representatives listed below to retrieve necessary information or to setup your account. BCSI is a supplier of corporate stationery programs and is fully integrated with e-Quantum, resulting in significant reduction in administrative costs associated with processing business cards and stationery orders. BCSI has recently added XML invoicing as an option for e-Quantum distributors as part of the XML integration. Take advantage of seamless order processing with BCSI by contacting sales@e-quantum.com to get setup with the All Vendor XML. Welcome to e-quantum.com, e-Quantum's home on the web. As you may have noticed, we have launched our newly redesigned site and we hope that you find the navigation more intuitive and the overall experience more enjoyable. Take a look! Here's your opportunity to learn all about e-Quantum's optional modules that are sure to enhance your business processes allowing you to grow your bottom line! NEW features and modules will be presented! Register to learn about them today! Dates and times listed below.